Signing into Digital. UV Inks Make Headway into Thermoforming. Thermoforming is used in building and construction, automotive/transportation, medical, and signage industries. Manufacturers looking for a cost effective and cohesive method of decorating thermoformed materials look to UV digital printing technologies. Today’s UV inks sets are designed to flex and stretch properly during the thermoforming process. The result is a high-quality thermoformed piece. Sign companies are ahead of the curve when it comes to instituting digital into thermoforming practices. Here, we learn about one business enjoying the benefits of digital printing technology in house for thermoforming. Jones Sign Co. of De Pere, WI focuses on sign production—printing, manufacturing, installation, and maintenance—for automotive parts stores, convenience stores, retail locations, parks, and shopping centers. In business since 1910, the company operates out of eight different locations throughout the U.S. and internationally. Its manufacturing facilities make up over 325,000 square feet and another 50,000 square feet includes office space. At its WI location alone, the company employs 300 staff members. Part of the company’s success contributes to instituting a lean manufacturing model a few years back throughout most of its operations. One segment that had yet to be touched was thermoformed signage. In 2017, Jones Sign Co. made a commitment to the EFI VUTEk GS3250X Pro printer with EFI GS-CF thermoforming inks to address the waste and manual labor issues from its traditional screenprinting process. The EFI VUTEk GS3250X Pro was chosen for multiple reasons. Mortensen particularly liked the special thermoformable ink set. He also was impressed with the printer’s consistency. He notes that while the quality of the digital printer was on par with screenprinting, the consistency difference is what sold him. “It isn’t that the VUTEk printer is better than a good screenprint, but it’s consistent. Screenprinting isn’t always consistent—it depends on the operator. Screenprinting is pretty exacting on smaller pieces, but when producing big pieces, a little difference in pole rate or tension can make a difference in the final print,” shares Mortensen. Using digital printing in relation to thermoforming allows Jones Sign Co. to reduce costs by avoiding errors. For example, on an 8×10-foot face, the shop could run several hundred dollars in materials. A mistake on a screenprint job means throwing it all out. And since consistency is key between each and every sign for a customer, it is definitely a possibility that an error can occur, as the company strives to make sure each sign is perfectly printed and properly formed—a sign in CA must match the sign in NY. “That kind of consistent precision is extremely hard to achieve with screenprinting. We were attracted to the EFI VUTEk GS3250X Pro because you could do it with software. Just print up the sign, and when you form it, it comes out perfect. Everybody is happy,” concludes Mortensen. 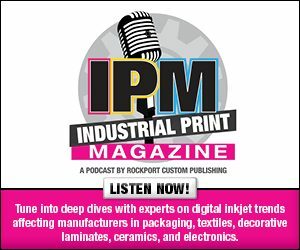 If thinking about adapting digital inkjet into your business like Jones Sign Co. did, here are some UV inkjet ink sets that are compatible with thermoforming. EFI VUTEk GS-CF and GS-TF UV-curable digital inks are formulated for first-surface interior and second-surface exterior and backlit applications where common thermoplastic is specified. They use automotive-grade pigment for best-in-class lightfastness properties. VUTEk GS-TF ink offers greater than 1,000 percent elongation, making it suitable for thermoforming on most thermoplastics, but it can only come in contact with smooth mold materials like aluminum and Teflon coated. It is ideal for deep draw, high-elongation applications. VUTEk GS-CF ink offers elongation greater than 200 percent for gentle thermoforming without blocking or smudging. It features excellent adhesion qualities on difficult media types and a great release on smooth and porous mold materials. Fujifilm North America Corporation reinvented its UV-curing ink specifically for thermoforming. Uvijet KV jets exactly like a normal UV ink, but during the forming process becomes thermoplastic, elongates, and finally cools to its original properties. Its elongation is excellent, right up to the useable limit of the substrate, even on 90 degree corners. Kao Collins Inc. offers a CMYK UV ink set formulated for wide format printing of typical thermoforming substrates and bends slightly over 180 degrees depending on the substrate. Kao Collins also color matches a UV ink if a specific spot color is needed. Mimaki USA, Inc. LUS-350 is a UV-curable thermoforming ink with a 350 percent potential increase in size, per drop. Additionally, LUS-350 offers a white and clear ink. Ideal for printing onto substrates such as PETG, acrylic, polycarbonate, polystyrene, and PVC, LUS-350 is resistant to scratching or dimpling. When heated, it transforms into a pliable state with up to 350 percent elongation. When cooled, it returns to a hard, durable surface in the shape of the thermoforming mold. This ink offers a fine finish for applications such as automotive components, molded signs, and prototypes. Roland DGA Corporation’s ECO-UV S inks can be thermoformed up to 220 degrees. Developed in early 2012, they were first used with the company’s VersaUV LEC series inkjets for printing and cutting applications in the packaging industry. Many of customers use VersaUV LEJ-640 printers with the ECO-UV S inks to print onto thicker plastics and create signs with heavy curves, bends, and bulges—applications where having the inks print without cracking is imperative. Sun Chemical offers a high-adhesion ink set, Crystal UVG, which delivers elongation properties of 250 percent. This can be further improved depending on application requirements, with the chemistry capable of achieving elongation properties of 500 percent. These formulations are designed to balance adhesion, stretch, flexibility, and surface resistance. Manufacturers should look for a UV ink that offers good adhesion, surface resistance, and longevity when it comes to thermoforming. While digital printing offers many benefits, if the incorrect ink is chosen then the positives of using this technology are negated. When correctly selected, success similar to Jones Sign Co. is achieved. Click here to read part one of this exclusive online series, UV and Thermoforming.